Glimmers of Hope for Greenwich Council's Public Spaces? One of my recent posts finished by saying I would write a bit more about other future schemes coming to Greenwich Borough, funded from the £2.5 million pot of cash Greenwich gets each year. 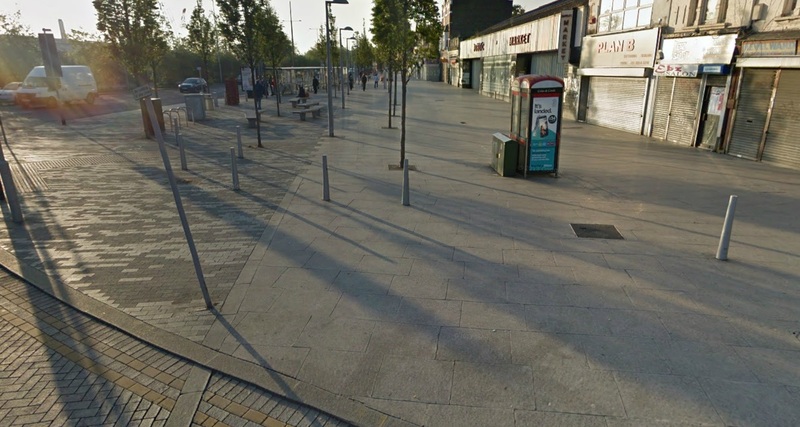 This post covers another planned large future town centre regeneration scheme at Woolwich, along with a look at future cycling plans. The road in question, in line for a major dollop of cash, is Plumstead Road. This is for streetscape improvements, and to help bridge the divide between the new developments under construction and the town centre. It will continue the improvements made to the areas by the market and the Dial Arch pub. Cycling improvements are also planned for the same road, which I will cover later in the post. Plumstead Road will soon be lined with towers along much of its northern side, with quite a bit of new retail facing the road. This is a wide road, that formally had three lanes of traffic in each direction, though was altered about 10 years ago. It still has a wide ‘footprint’ though, with a large central reservation and extremely wide paving on certain sections. There’s scope for big changes. Plumstead Road could, and should, be an attractive ‘avenue’ like road, as further large scale re-development spreads along it. The streetscape, seen by the Royal Arsenal Gatehouse, should set the template. It does need a cycle lane at this section though. On this part of the street we can see the results of recent streetscape changes – lighter toned, attractive paving with high quality lamps. Directly behind this is the old road layout, alongside which the new developments will be built. Large scale improvements further along the road will hopefully see all superfluous signage go, removing a lot of the visual mess and obstructions. This also has long stretches of railings currently lining the road encouraging speeding. There’s also a number of mature trees lining the road that will be a real asset to future developments, softening the road’s appearance, and also helpful in fostering an appearance of an attractive avenue in future. Also running along much of the north side of the road is the tall brick Royal Arsenal wall. I think parts are listed, but it would be a big barrier to new developments to retain all of it and hopefully some parts will go and the site opened up. These funding sources, plus the large payments from developers in that area, will ensure improvements are almost a certainty here. Ambitious plans will grasp the huge changes along the road and create a far better street. Whilst looking at the current condition of the area, I checked out google maps, and saw yet more cracking examples of Greenwich’s council Highways Department’s ineptitude, even on the new redeveloped sections. Whilst it will be great for the initial design quality of the recent improvements to extend along the road, some of the council’s recent intrusions to that section could do with knocking on the head. This is an area improved at a cost of £6 million but has already begun to fall under the council’s ‘design’ spell. All that is needed is a consistent line near the curb placed at regular intervals. Here you have another square in the paving where a tree stood, and bollards duplicating each other. Needlessly obstructing people in wheelchairs, buggies and other pedestrians at a very busy point. But then to the left there’s a large gap so cars drive straight through, as seen by the parked van. There is also a large expanse of tarmac where someone has dug up the paving (which was expensive stuff) and then not bothered to replace. Whoever did that should have, but it is Greenwich council’s responsibility to enforce it. And if they can’t a couple of hundred yards from their own town hall, in a major town centre shortly after a multi-million pound upgrade to the public realm, then where will they? Another bent sign. The bollard a centimetre from the bin – two metres to the left would help. Also two bollards within an inch of each other a couple of metres to the right of the sign. Amusingly amateurish. It really is a case of stick the pin man down on google maps, on pretty much any street within the Greenwich borough boundaries, and you see terrible design. Often dangerous as well. Logic and attractiveness are rarely considered factors. Can’t argue with that. It does all require improvements. As seen, Woolwich is mentioned quite a lot for future TfL public realm funds. Understandable given the huge developments and Crossrail. Strangely though, Abbey Wood is rarely mentioned within the 2014 document even when looking at future schemes. It is a place with big potential, some large schemes such as Cross Quarter and has Crossrail coming, yet barely warrants a mention from the council regarding seeking funds for improvement. Armadillos are small, raised bumps on the road, and look set to spread quickly across the UK, after Department for Transport approval. The DfT can take an age on approving road changes but it looks like the green light has been given. Andrew Gilligan, who is the Mayor’s Cycling Commissioner, suggests that London will be seeing more of these easier and cheaper segregation measures – “This is what we want to do much more widely in London. 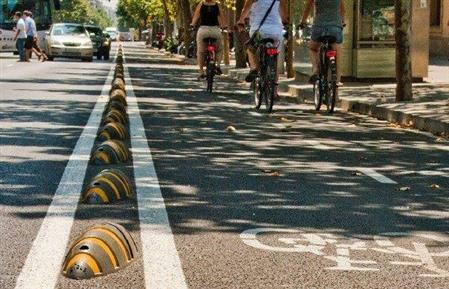 It is low impact, low cost, but it satisfies the needs of cyclists”. Click here to read more about them and other low cost methods to separate cars and cycles that are more effective than a bit of paint. It’s good to see an acknowledgement that they are looking to seek money from the various bodies and funds. Yep. Improve your streets and public realm and more people will walk. I actually think express buses are a great idea, particularly in outer London. Areas such as South East London have a very limited tube network. An express, limited stop bus from Eltham to North Greenwich station would be great. Similarly from Thamesmead to Abbey Wood and Woolwich Arsenal stations and carrying on to north Greenwich along the lines of the cancelled Greenwich Waterfront Transit. The 472 could stay as the slow stopping bus, and a fast bus alongside stopping only at Woolwich and Charlton running at peak times. Very slow buses put off many and SE London sees many heading to North Greenwich due to the lack of a tube network. However TfL aren’t fans of express buses. There used to be quite a few across London and now just a handful. It would take a big shift in their thinking. This does have the feel of Greenwich including pie in the sky ideas without them being realistic right now. They have had some odd ideas before, such as taking over bus routes within the borough from TfL, that will never happen. I hope they aren’t planning to put money into studies and consultants with this idea without first asking TfL if there’s any chance whatsoever of it being allowed. So then, the road from Plumstead to Woolwich will likely see big changes, providing a far better cycling experience, along with a far better and more attractive pedestrian experience in 5 years time. It could even become an impressive tree lined avenue with decent architecture and active frontages along some of its length. As long as Greenwich borough aren’t too involved in the design that is, based on previous form. As for what happens after all the investment…well hopefully it isn’t ruined incrementally, and a culture change takes hold. Why do I get so easily wound up? Those stops are badly placed as they cause queues and are located on the corner. TfL often don’t talk to each other. It would be better if that whole stretch became a TfL managed route. they would actually be more likely to sort it then, bizarrely. Plus they are a lot better at removing obstructive crap from paving. Reducing lanes from cars AND buses on the stretch from Plumstead to Woolwich was a massive, costly mistake. My bus journey back then tripled in time due to traffic. I had to switch to more expensive rail and walking. If older and less mobile I would have got a car.